If you want to get out and enjoy this and community events in Moorpark, you need to be able to rely on your garage door to do as it’s told and let you in and out of your garage. 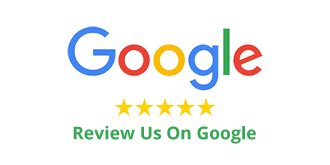 If your garage door isn’t so reliable, you can always call Carroll Garage Doors for garage door service Moorpark CA. 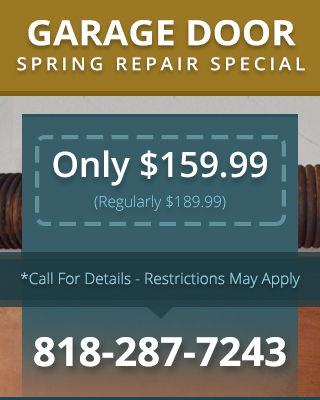 While many garage door repairs can be done by anyone with a tool set and some mechanical aptitude, garage door spring repair Moorpark CA is not one of them. Because garage door springs are under tremendous tension even when broken, they can be quite dangerous. 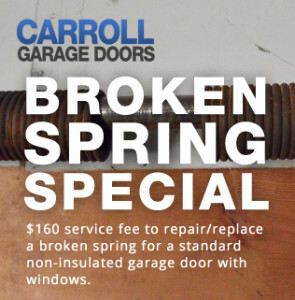 Rather than risking your personal safety by tinkering with a broken spring, call in the professionals from Carroll Garage Doors. We can remove and replace the broken springs safely. Plus, we will ensure that the new springs are properly calibrated for an effective, long-lasting repair.